In the morning of April 9, 1940 Germany invaded Denmark and Norway in a surprise attack. Denmark had virtually no chance at all and was quickly overrun by the well-trained and experienced Wehrmacht. After six hours Denmark had no choice but to surrender. The quick surrender is thought to have resulted in a more lenient treatment of the country, and also delayed deportation of jews until late in the war, when most had already been able to escape. Norway fought longer, and managed to sink the heavy cruiser Blücher just outside Oslo during the initial phase of the invasion. The southern part of the country fell fairly quickly, but it took 62 days before Germany had full control of the country, making Norway the nation that withstood a German invasion for the second longest period of time, after the Soviet Union. Growing up in neighboring Sweden the events of April 9 were well-known to me, and since I have always been very interested in history (and especially conflict history like WWII) I did read a lot about this. I remember reading stories about Norwegian bus drivers who had their busses confiscated and loaded with German soldiers and then promptly driving themselves off the steep mountain roads, taking dozens of enemy soldiers with them in death. They were as brave as the soldiers fighting the invading forces on the different battle fields. Sweden was never invaded or directly attacked during WWII, and that was probably very good. Despite starting to rebuild the (by then almost non-existing) military in the late 30’s when the threat from Hitler could no longer be ignored it would have taken until around 1950 until Sweden had a military force that could stop an invasion. It takes time to build up a military force, aquire equipment and teach the soldiers to use it, train officers in sufficient numbers and give them enough experience to lead troops. Soviet Whiskey class submarine U137 on ground outside Karlskrona, Sweden. The time when I grew up was at the tail end of the Cold War (even if we did not know it then). 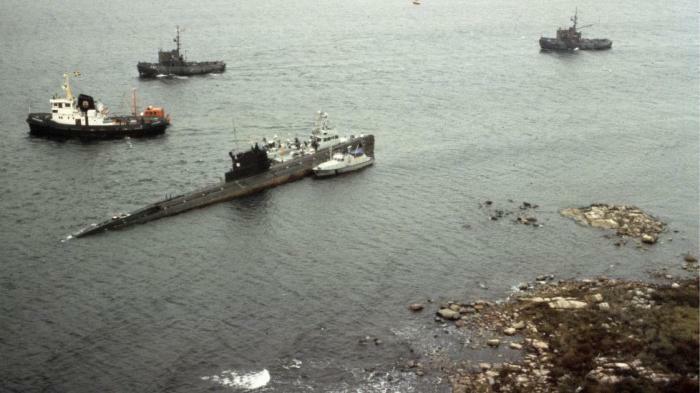 I remember the Soviet submarine U137 (actual designation S-363) running aground in southern Sweden in 1981, causing a tense stand-off between Swedish and Soviet military forces. Swedish fighter pilots had young eastern european men visiting them at home, posing as Polish students wanting to sell paintings or books in order to finance their studies. But strangely enough they only visited pilots, not their neighbors… They were most probably mapping out where the pilots were living, for Soviet special operations units to be able to assassinate them right before an attack on Sweden and thereby cripple the Swedish air defenses. We also had the Soviet invasion of Afghanistan in 1979, as well as numerous other conflicts all over the world. Not to mention the threat/fear of nuclear war. So in short, it was an interesting and somewhat scary period to grow up, especially living so close to the “Russian Bear”. Sweden have a long history of war with Russia. 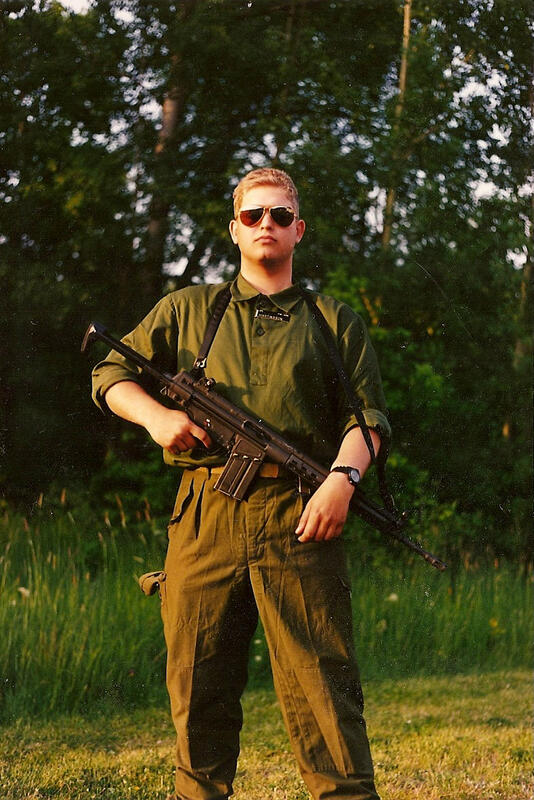 Me in 1990 during a training exercise in Sweden. In 1984 I joined the Swedish Home Guard at age 15. At that age I needed my parents to sign a consent form, but they did. They realized that it would be good for me. The training took place about every third weekend during the school year, with a break during the summers. It was fun and I did learn a lot of things, everything from first aid, survival skills, shooting, using map and compass with great precision, operating radio systems and of course to get along with and work side by side with people/kids from other backgrounds than my own. At one point I even considered a career in the military, but I quickly decided that computers and programming was more interesting and fun. But I continued as a member of the Home Guard for 13 years, until I moved to the United States. By that time the Cold War was over and the politicians had started to dismantle the military as they did not expect any threats or invasions anymore. That was of course the same way as most of Europe had dismantled their military after World War I, also known as “the war to end all wars”. We now in retrospect know what a bad idea that was. Sweden is today in the same situation, with a almost non-existant military. The politicians finally realized late last year that perhaps Putin was not such a nice and peaceful guy and decided to increase the military spending, but with very small amounts and over many years. And just like in the 30’s and 40′ it still takes a long time to build up an efficient military force. You don’t hire a major or colonel from your local temp agency… Hopefully there will not be a large scale war in Europe but there is a war going on in Ukraine right now and Putin have been eying the Baltic states lately. If you haven’t read Command Authority, the last book Tom Clancy wrote before he passed away in 2013, I suggest that you do. It is scaringly accurate, and it was written before Russia invaded Ukraine. So time after time history have shown that the old saying is true: “Every country has an army, either their own or somebody else’s”.